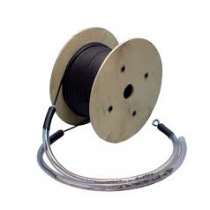 Our OM4 (mm) pre-terminated fibre optic cables make installation easy with no specialist equipment or knowledge required, and come with quality guaranteed. We manufacture pre-terminated fibre cable to any required length with ST, SC, LC or FC-PC connectors, available in multimode or singlemode with 4, 8, 12, 16 or 24 fibre counts. Upon termination, we perform rigorous tests to ensure industry-standard quality and supply these test documentations with the cable. To avoid damage the fibre is fitted with an armoured plastic tube, completely covering the terminated fibres to offer quality protection during transit and installation. The tube in turn has a Kevlar™ pulling eye so even difficult cable runs can withstand greater pulling strain without damage to the fibre. We can also manufacture different lengths if required, so please call if you cannot see the length you need.